This fall Jim Solatie and I spent quality time at two of the best DXpedition locations in the Finnish Lapland. 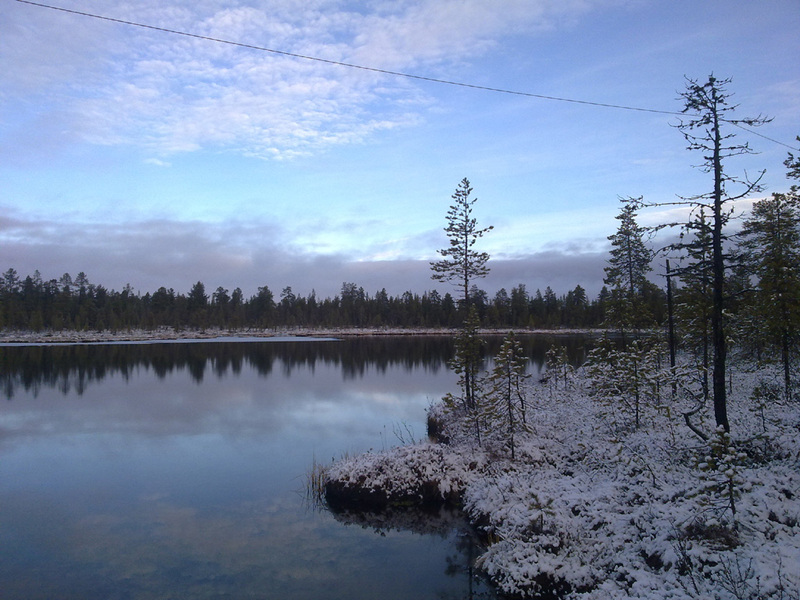 First we enjoyed a week in Aihkiniemi, a brand new AM DXing base in the far north of Finland, then a second week in the traditional DX Mecca, Lemmenjoki. A definite highlight of the week in Aihkiniemi was catching a bunch of New Zealand AM stations, a first for me. Another unforgettable event was picking up the faint signal of a 10-watt highway advisory station from Alaska. Hearing rarities like these during below average conditions is a promising indication of the quality of this new base. Convenience beat frugality, and so we took the train instead of driving through the night. Jim joined me at the Helsinki railway station, and we packed his stuff in my Nissan Murano for the ride north. 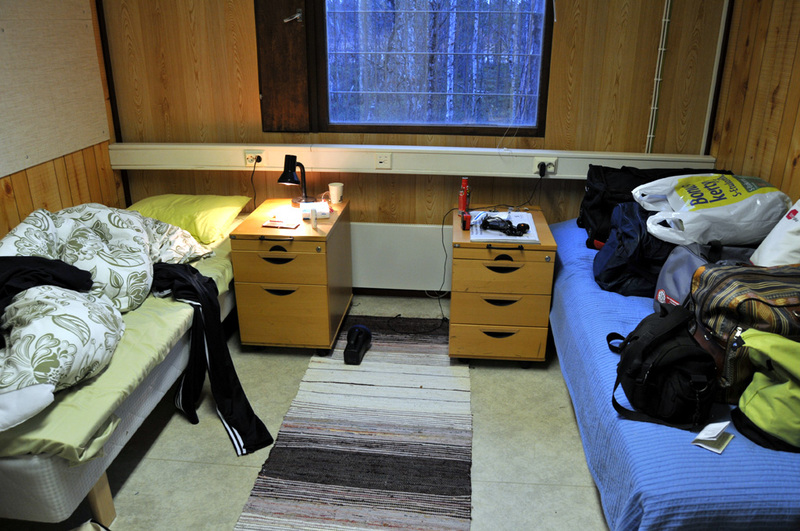 Our cabin even had a private shower, which we learned to appreciate as there wouldn't be one in Aihkiniemi. We woke up early on Saturday, October 16, when the train arrived in Rovaniemi on the Arctic Circle, to continue the journey driving further north. 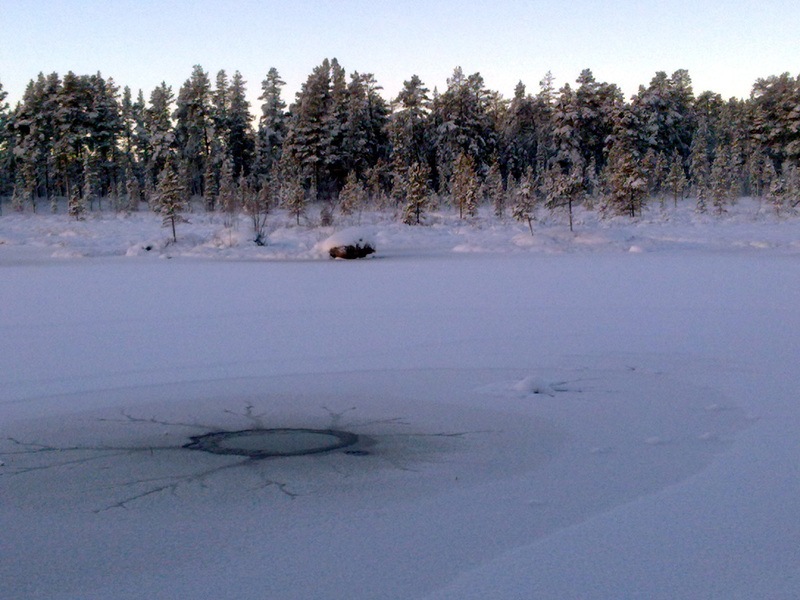 The weather was far from Arctic, but it was set to change dramatically over the week. 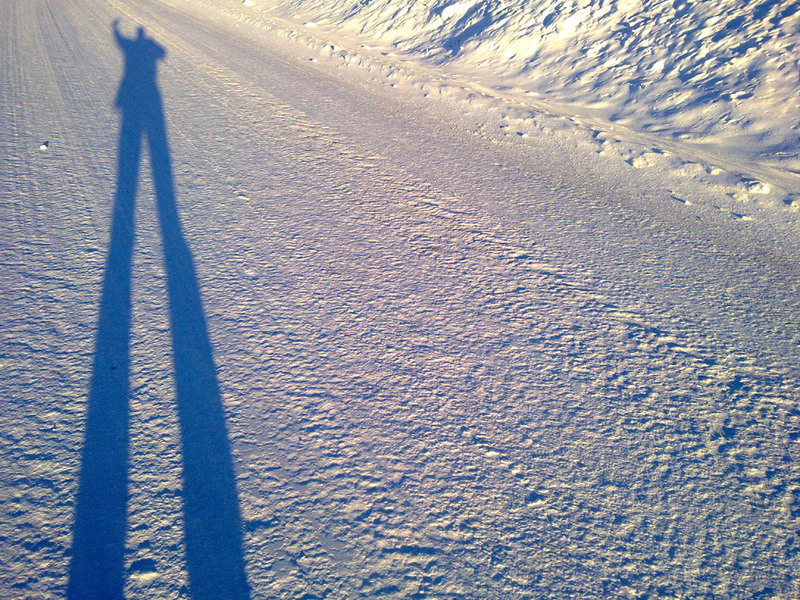 We ran into reindeer several times, but fortunately didn't run over any. 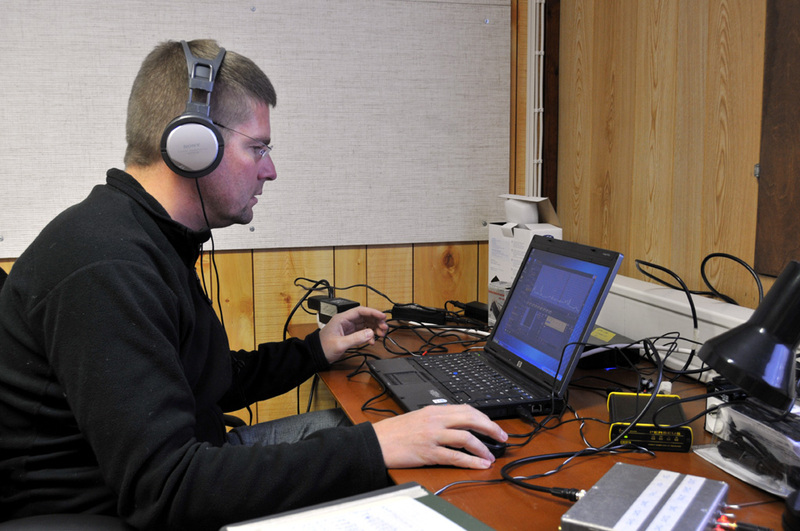 This DXpedition entailed more uncertainty than normally, as Aihkiniemi was still somewhat a work in progress. 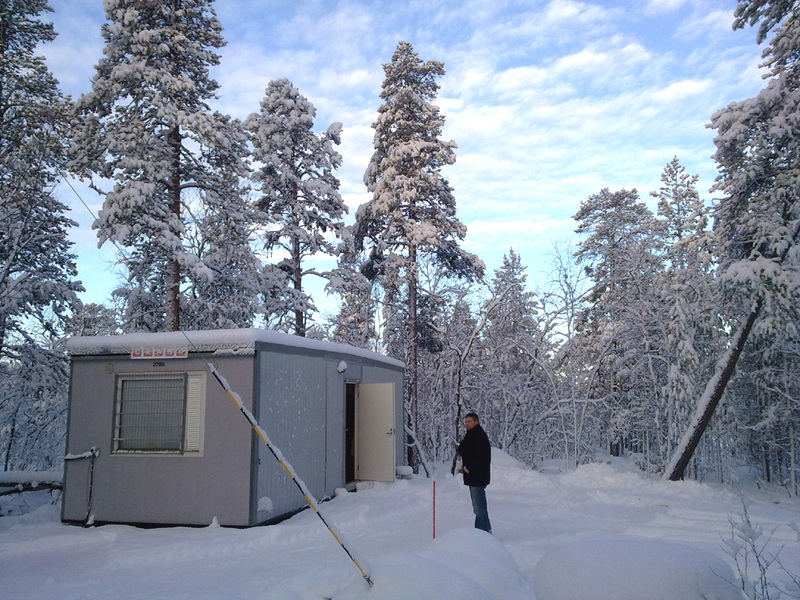 I and Jim are among a group of eight DXers who purchased a lakeside lot in northernmost Lapland earlier this year to set up the first ever purpose-built AM DXing base in Finland, if not the first such endeavour in Europe or the World. DXer Martti Karimies successfully ran the project and got things moving fast. Just a few months from the land deal and building permit we already had a working DX base. Aihkiniemi is located at 69.23 degrees North and 27.87 degrees East, essentially in the middle of nowhere, so we got to christen the place. 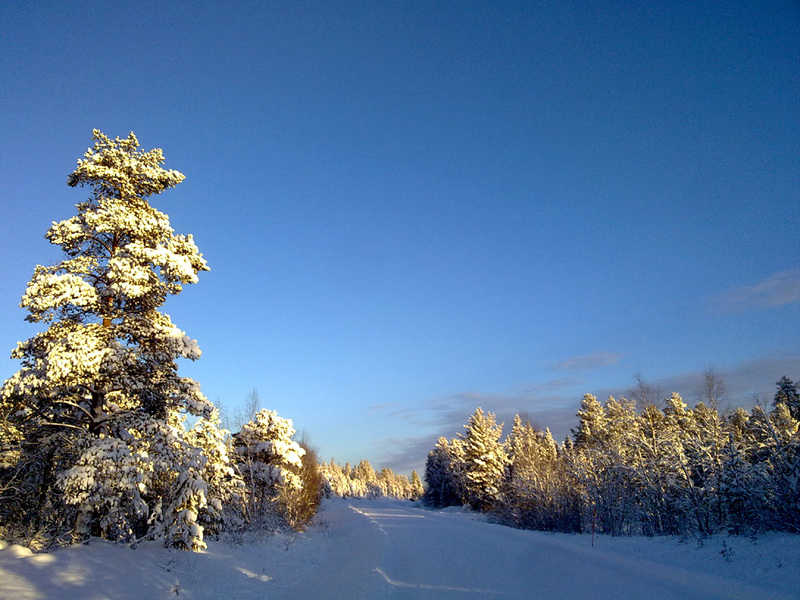 According to title records, the original larger property had been called Aihkiniemi, so we resurrected that name to refer to this new DXing haven. 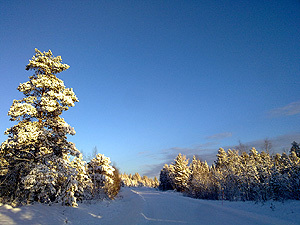 "Aihki" means a grand, ancient pine tree, specifically in Lapland, and "niemi" translates as a cape or a peninsula. Sure enough, there are impressive old growth pines in the area, and the landscape is dotted with tiny lakes and rivers carving a very varied terrain, and one that is sometimes very difficult to cut across. Our group had bought, refurbished, and transported a container-shaped cabin from a construction company, and in August we had built eight beverage antennas, each close to 1 kilometer (over 3000 ft) in length. I and Jim erected the ninth antenna, pointing at 30 degrees, which brought us the Southern Pacific goodies. At least one more similar size antenna will be built by later DXpedition crews. 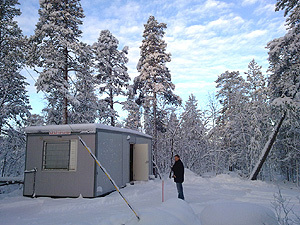 The 30-square-meter cabin is very basic and looks spartan, but it is well-equipped for two DXers. There is a bedroom for two, an indoor composting toilet, and a listening room with a kitchenette. The toilet is real hi-tech, odorless and cost more than the cabin itself! Our lot sits right next to a paved road that leads to Norway, so having a driveway built and getting electricity didn't cost a huge fortune. On arrival we were a bit confused about the workings of the antennas, and couldn't get a decent signal out of an amplifier that we used in the cottage, so Saturday night and Sunday were spent on trying to fix things. We built the 30-degree antenna over swampy ground, and worked on the baluns, Jim being the seasoned expert and me the clueless disciple. Eventually getting a good enough signal from nearly all the antennas. Aihkiniemi turned out to be relatively free of interference. Our own AC adaptors were the biggest source of unwanted sounds on the AM dial, although we tried to exclude the noisiest adaptors already in advance. Fluorescent lights in the cabin had to be turned off during the daytime, and will need to be replaced in the future. A nearby power line with ADSL signals might have caused some faint interference, but we were unable to verify the source. In the future, once everything is running smoothly, we intend to make this base available for other DXers as well. As receivers we relied solely on the Perseus, which should guarantee enough recordings to entertain us for the rest of our lives. Detailed log listings will be published at some point in the distant future because of the overwhelming workload of checking the files. 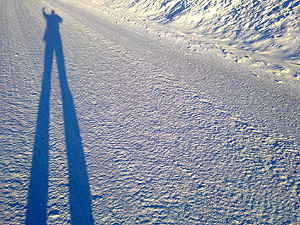 Jim's stay in Aihkiniemi was unfortunately interrupted by work obligations, and already on Monday I drove him to the Ivalo airport for a flight south, but I continued making recordings on his behalf as well. A shared bedroom  better make sure that your partner doesn't snore! 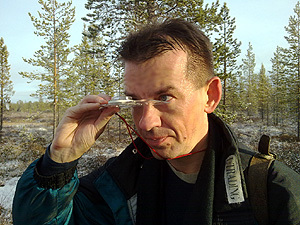 This was the third DXpedition to Aihkiniemi. The beginning is always tough in a new place, and the first two crews spent even more time on construction and problem solving. Most likely upcoming DXpeditions will produce even more impressive logs than ours, but this week was enough to convince me that we've found a real gem for AM DXers. Once I had overcome most technical hurdles, it was time for some serious DX. On most mornings I got very good reception from various parts of the Western Hemisphere around 0430-0600 UTC. On a few days stations from the Pacific Northwest remained on the dial through the day, but generally daytime conditions didn't amount to much, and nighttime conditions were very poor. In late afternoons, conditions to China were excellent almost every day. Occasionally I also got nice reception of Korean and Japanese stations, areas which tend to be more productive in terms of new catches. The more southern antennas towards the Eastern Hemisphere continued to have problems, so I missed lower latitudes in Asia. 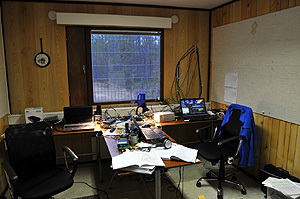 The highlight of the DXpedition was Thursday, October 21, when conditions to all directions seemed very good. After a nice morning I picked up Newstalk ZB, the first New Zealand AM station of my life, at 1108 UTC on 1035 kHz. I identified a couple of other Kiwis as well in real time, including Southern Star on 657 kHz at 1207 UTC, when a local pest in Murmansk on the same frequency luckily happened to be off the air for some reason. What an unforgettable afternoon! To put things into perspective, I have been actively hunting for Kiwi AM stations for over a decade without catching any. Now I heard a bunch of them after only four days of monitoring with the new 30-degree antenna in Aihkiniemi. This opening seemed remarkable to me, although according to our Norwegian DX friends in Kongsfjord (see the KONG20 DXpedition blog) it was really not that exceptional compared to the previous couple of weeks. So, even better days can be expected. Lemmenjoki offered another point of comparison, because a few NZ stations were noted at the same time there as well, but much weaker. Based on all this, it would be safe to say that Aihkiniemi is currently the best place in Finland for DXing New Zealand, and by extension, probably other targets in the Southern Pacific as well. By the time I am writing this, Jim and I have discovered 16 Kiwi stations, and quite a few promising frequencies remain to be checked. Another true highlight was picking up a 10-watt highway advisory station from Prudhoe Bay, Alaska, on October 20. WQLE259 caught my attention with its weather forecast loop running on 1610 kHz and audible for over an hour. The identity of this fairly new station remained a mystery, as the station ID was far from clear. Based on the conditions at the time, I initially suspected the Pacific Northwest, but low temperatures pointed to Alaska, as Jim quickly found out. West Coast DXers Bruce Portzer, Chuck Hutton, and Patrick Martin came to the rescue and nailed down the identitity of the station. After a restless week I got my first TIS/HAR station verified. 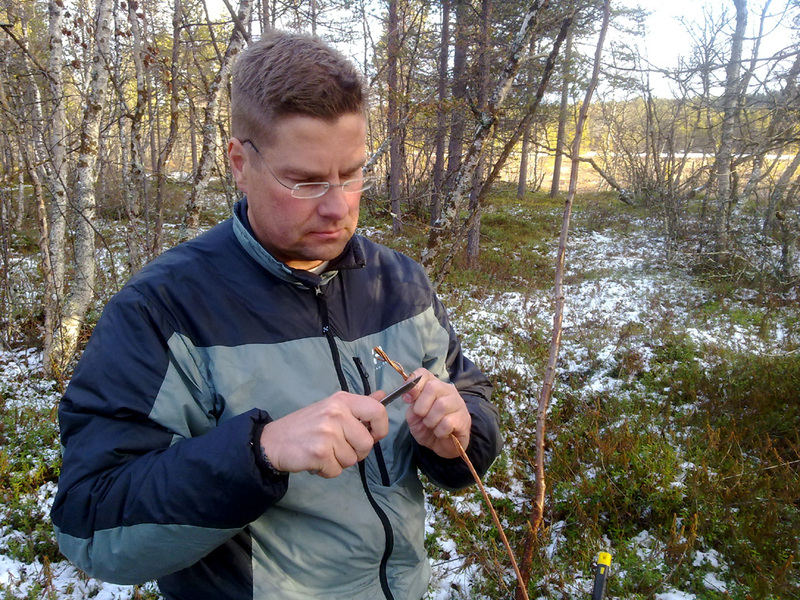 In addition to the previously mentioned KONG20 in Norway, there were other more or less simultaneous DXpeditions in the Arctic regions of Scandinavia: LEM294 in Lemmenjoki in Finland, PAX78 in Parkalompolo in Sweden and AND6 in Andøya, Norway. Weatherwise the week was a rollercoaster ride back and forth between the fall and the winter. 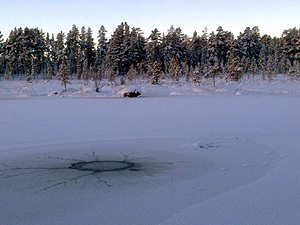 On the first day the small lakes were freezing, next morning they were solid frozen, and again free of ice by the following. On Saturday, October 23, heavy snowfall made navigating on the roads really hazardous, even with a four-wheel drive SUV. Winter had arrived, a bit earlier than usually. 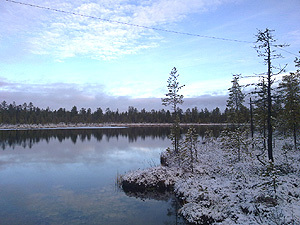 In addition to DXing, Lapland never ceases to impress with its untouched nature. 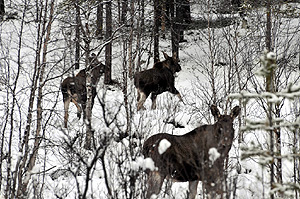 Some of the encounters can be unpleasant, such as trying to negotiate a path on a swamp where bogholes are covered by snow but remain unfrozen and treacherous. 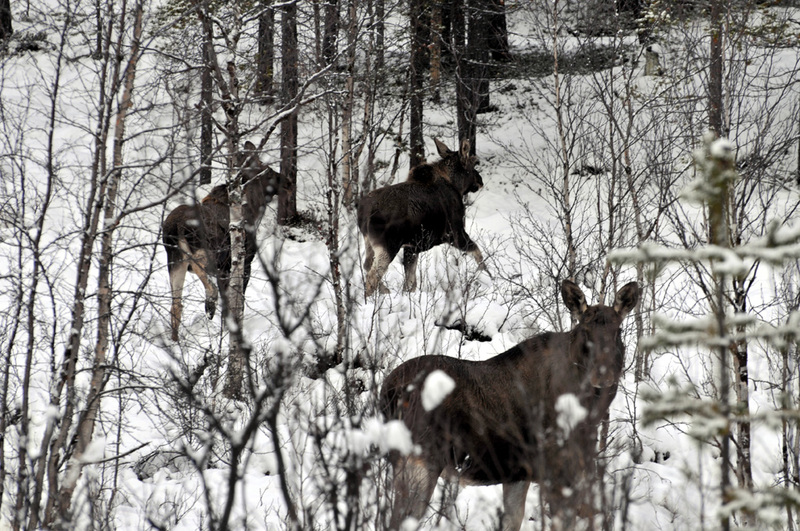 Also, on the roadside, for the first time I encountered three moose at the same time. A collision with just one would be enough to wreck the car and cause serious injury, even death. Better slow down on the northern roads. Reindeer, which are much more ubiquitous, are not nearly as risky, as they have shorter legs and don't tend to penetrate your windshield on impact. As I mentioned, there is no shower  nor running water for any other purpose. It meant huge savings in construction, but we paid a price. After a sweaty day working on the antennas we had to drive 14 kilometers to take a shower and haul drinking water from a rental cottage further north. Oh well, a minor inconvenience in the scheme of things. And of course, brave(r) DXers could take a dip in the freezing lake on our own property, although the water is so shallow that it isn't really suited for swimming. In the following you can find a detailed description of the solar weather during the week (thanks to Jan Alvestad), followed by a detailed review of reception conditions on each day. We arrived late in the afternoon, only to start working on the antennas and sorting out other technical problems, so that we didn't really have much time to observe the dial. Huge signals from Alaskan stations were noted, and even Hawaiians were heard, although we didn't even have an antenna pointed there. We got our recordings rolling barely before 1600 UTC, but it was already a bit too late for any interesting catches. After a poor night, propagation of North American stations began to improve before dawn, around 0330 UTC. Reception peaked at 0430-0530 UTC and focused on the Midwest and the Rockies, with some Mexicans in the mix. We identified for instance KASL Newcastle WY on 1240 kHz and KTOQ Rapid City SD on 1340 kHz. All daylight hours were spent building and fixing antennas, but we arrived back to the base early enough to catch a very good opening to the Far East around 1500-1600 UTC. We were able to identify for example many KBS stations and AFN from Korea on 1080 kHz, JOLC Tottori from Japan on 1125 kHz and Kungchuling PBS from China on 1485 kHz. Earlier in the afternoon, a bunch of Aussie goodies were logged in Kongsfjord, Norway, but we missed them, once again. A few weak Brazilians emerged around 2130 UTC, but basically overnight there were no trans-Atlantic stations to listen to. In the morning U.S. stations became audible around 0430 UTC. Our sunrise turned out to be a decent opening, 0500 UTC being the best top-of-the-hour, and by 0600 the stations had weakened considerably. Initially reception was best from the Midwest and the Rockies (including stations such as 1230 KYSM Mankato MN and 1570 KVTK Vermillion SD 1570 kHz). A bit later also East Coast stations were heard. Although North Americans vanished rather completely by 0700 UTC, the Rockies and the West Coast emerged again just before 0900 UTC, with such typical graveyard stations as 1340 KLOO Corvallis OR and 1400 KART Jerome ID. Around 1000 UTC some more Oregonians were heard, including 550 KOAC Corvallis, 960 KLAD Klamath Falls and 1240 KQIK Lakeview, as well as other stations from the Pacific Northwest, including 1400 KQMS Redding CA. In the afternoon, Asian stations were in full swing by 1400 UTC. Stations were heard from a wider area than before, from Japan to Thailand, so finding new ones is much more difficult than during the previous day. Also for example Hot Country on 1628.958 kHz from Australia made it here with a station ID. Jim, where did you go  I can't see you anymore? Nighttime was again poor, and the first North American stations appeared only after 2300 UTC. Although weak signals continued to be heard through the night, I doubt that my recordings would reveal anything interesting. In the morning around 0500 UTC just as I expected signals to gain strength, nearly all North American stations vanished, leaving just a couple of weak Albertans on the dial. Simultaneously, a handful of Brazilian stations became audible for a while. Spanish and other West European stations were exceptionally strong, so that I was finally able to catch the elusive COPE Murcia on 711 kHz and a couple of RNE stations during regional breaks. Stations west of the Rockies reappeared after 0800 UTC, but were generally very weak until improving just before 0900 UTC, in repetition of the day before. Today, however, the Pacific Northwest remained on the dial late, until around 1400 UTC. 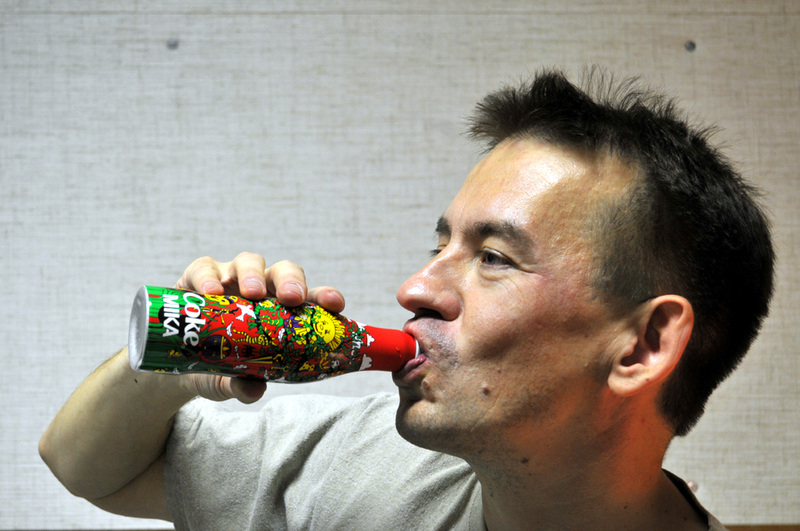 The first Asian signals rose above the noise floor briefly around 1140 UTC, but reappeared only after a lull of three hours, when it was already getting dark outside. The Asian mix quickly gave way to Iranians and Europeans. Weak X-band Aussies were heard around 1530 UTC, slightly later than on the previous day. Some of the most common Hawaiians appeared around 1230 UTC, and KUAU Haiku on 1570 kHz was booming like a semi-local, although I didn't even have an antenna pointing straight north. The first North American stations emerged already before 2100 UTC on Tuesday evening, and the first Brazilians a bit later, but signals remained sporadic and very weak. Brazil and Argentina were somewhat better in the morning after 0500 UTC. After 0400 UTC the Pacific Northwest gave the best reception of any trans-Atlantic area, and Mexicans showed up around 0500 UTC. Latin American stations gave a wild ride this morning, suddenly vanishing and soon appearing again, with a couple of Caribbean powerhouses heard even after 0630 UTC. As is customary, the Pacific Northwest, Alberta, and Alaska were heard more or less through the daylight hours, with improved signal levels after 1000 UTC. Trans-Atlantic stations vanished after 1200 UTC. Among the Northwest highlights are KLDY Lacey WA on 1280 kHz and KXRO Aberdeen WA on 1320 kHz  and of course WQLE259 on 1610 kHz, although it took several days to find out what it was all about. Apart from serious DXing, it was fun to listen to for example KHAR Anchorage AK on 590 kHz at armchair level. In the afternoon Asian stations popped up earlier than before on this DXpedition; the first signals were audible already at 1100 UTC. China, Japan and Korea dominated the dial, but also a few Philippine stations were noted after 1300 UTC, a first during this DXpedition. Signal levels were impressive, but it will be challenging to extract anything new from such a wide-angle Asian deluge. KCBS Chongjin on 702.041 kHz and HLKH KBS Gwangju on 747 kHz are among today's highlights. Both North and South American stations were heard through the night with relatively weak signals. Stations from Brazil and Argentina peaked remarkably late, after sunrise at 0600-0645 UTC, which was convenient, as strong European interference had already begun to subside. Especially UK stations were exceptionally strong this morning, beating Spanish stations on the same frequencies. North American stations remained on the dial after sunrise, which was a welcome change to the routine of the previous days, and only the very low end of the AM band pretty much sank into the static. Another welcome change was that the best propagation didn't immediately move on to the Pacific Northwest, but stayed in the Great Lakes area instead, with also many East Coast stations going strong. Cubans peaked around 0700 UTC. Overall, this was a very good morning compared to the previous ones on this DXpedition, but rather ordinary compared to average October propagation conditions. Mexicans and graveyard channels improved after 1000 UTC as conditions began to shift westwards. I eventually heard Newstalk ZB on six different frequencies (1008, 1026, 1035, 1080, 1215, 1296 kHz) fading in and out, over a period of more than an hour. On the air was overnight host Nick Robinson. I emailed him, and got back a nice verification. Later Nick also shared my report with his audience; you can hear the first and second clip here. The first clip contains one of the recorded IDs that I sent; it was clear enough that Nick was able to play it on the radio for his local audience. Then, the afternoon was a fulfillment of a longtime dream: my first New Zealand AM stations. The new 30-degree antenna works like a super vacuum cleaner. One of the long-sought stations was Southern Star, Wellington, on 657 kHz just as Murmansk across the border had turned its transmitter off for some reason  it was back on the air later the same afternoon. I also became acquainted with the Newstalk ZB format. I sort of anticipated goodies from Down Under, so I had some Rawson's Retreat Shiraz Cabernet from Australia at hand to celebrate the milestone  the Inari wine shop didn't stock Kiwi red wines. Superb conditions to the Eastern Hemisphere continued with an overdose of Japanese and Chinese stations. Nighttime conditions were better than before this week, both to North and South America, where also the upper half of South America was represented  hardly heard before. Before daybreak, the focus was in the Rockies, from Alberta to Baja California, but also Spanish stations were booming. Signal levels subsided and the lower end of the AM band mostly vanished after sunrise, but Westerly conditions continued. North American stations vanished by 0830 UTC, but emerged briefly again just before 1000 UTC. The afternoon was poor, only weak stations from the Pacific Northwest. Asians arrived late, around 1300 UTC, and were under heavy European interference. Eventually conditions to Asia turned out to be not totally hopeless, but spread over a wide area from Japan to Iran  and not having a proper antenna pointed at South Asia hampered efforts to find something new. Overnight conditions to Brazil seemed decent at times, and also U.S. stations were heard during the wee hours, but at dismal levels. At daybreak signal levels on the entire AM band collapsed, and the morning seemed a total loss until there was an opening to the Caribbean around 0515-0600 UTC, with Radio Comercial from the Dominican Republic on 1010 kHz being the highlight. Spanish stations were booming, which was expected, as this was a Saturday with very limited chances of catching local or even regional station identifications. After 0600 UTC only European powerhouses were left on the AM band, so it was painless to pack up everything, and head to Lemmenjoki for another week of DXing.